We celebrate the gift of Bob Kasworm, commissioned to serve in Tanzania beginning in January, 2005. Bob travels extensively in Tanzania on behalf of Alegent Healthcare Systems, the Lutheran Church, and the Tanzanian people. 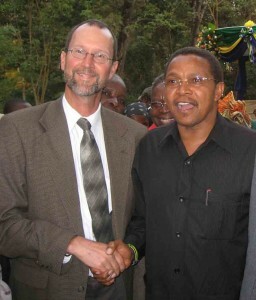 Here we see Bob with the President of Tanzania, Jakaya Mrisho Kikwete. Check here often for his new messages.